Jeff Davis Weekends Saturday & Sunday 7-11pm 94.7 WLS.com!
! Oh, and... turn it up LOUD! Mayor Rahm Emanuel, the Department of Cultural Affairs and Special Events (DCASE) the Illinois Restaurant Association (IRA) are pleased to announce a diverse lineup of 35 restaurants that will participate throughout the highly anticipated, five-day food and entertainment festival Taste of Chicago, July 10-14 in Grant Park. Taste of Chicago is produced by DCASE in coordination with the IRA, which manages the food and beverage operation. Alongside Taste of Chicago’s classic favorites, the 2013 event welcomes several newcomers, including Bombay Spice Grill & Wine, featuring healthy Indian fare; French Market favorite Flip Crepes; Lao Ma La Chinese by acclaimed Chef Tony Hu; and the decadent, Southern-inspired Wishbone Restaurant. Additionally, after taking part in last year’s crowd-pleasing pop-up pavilion, both Beat Kitchen and Caffe Gelato return in 2013 as five-day participants. All vendors will showcase signature menu items, as well as the popular “Taste Of” portions priced at $2.50 or less, allowing guests the opportunity to sample an even greater variety of items. Many will also include Humana Healthier Choice selections for those seeking lighter options. Admission to Taste of Chicago is free, and tickets for food and beverages can be purchased in strips of 12 tickets for $8. Tickets will also be available for purchase beginning July 1 at Dominick’s grocery stores throughout the Chicagoland area. 8734 S. Stony Island Ave.
6701 W. Forest Preserve Dr. The 33rd Annual Taste of Chicago is July 10-14 in Grant Park. (Taste of Chicago hours are 11 a.m. – 9 p.m., Wed. – Fri.; 10 a.m. – 9 p.m., Sat. and Sun.) For more information on the free admission festival, call 312.744.3316; TTY: 312.744.2964 or visit tasteofchicago.us. Join the Taste conversation on Facebook at Taste of Chicago and follow us on Twitter, @TasteofChi2013. Founded in 1914, the Illinois Restaurant Association is a non-profit organization dedicated to promoting, protecting, educating and improving the restaurant industry in Illinois. The Association manages the food and beverage portion of Taste of Chicago for the Department of Cultural Affairs and Special Events. Visit illinoisrestaurants.org and follow up Facebook and Twitter. Homestead – a literal farm-to-table restaurant featuring cuisine rooted in “rustic elegance” by Executive Chef Chris Curren; specialty cocktails, spirits, wines, and beers from Beverage Director Benjamin Schiller; and dessert and bread from Executive Pastry Chef Chris Teixeira – will open to the public at 5pm on Friday, May 31. Homestead patrons will enter the restaurant through Roots Handmade Pizza (1924 W Chicago Ave), and will be led upstairs to the unique dual space on the second floor. Homestead will not accept reservations. Homestead will be open 5pm to 2am Tuesday thru Sunday. Homestead will be closed on Mondays (and Homestead will be closed to the public on Sunday, June 2 for a private event). Homestead will serve its full food menu until 11pm each night it is open. The Homestead outdoor second-floor patio will be open until midnight each night the restaurant is open. Patrons can enjoy cocktails, spirits, wines, and beers inside Homestead’s indoor air-conditioned second floor space until 2am every night the restaurant is open. The outdoor rooftop of Homestead features 80 outdoor seats with full view of the L-shaped 1,000-square foot organic rooftop farm and two massive vertical hanging gardens. The light-filled and airy second-floor interior air-conditioned space at Homestead – featuring live birch walls, bespoke glass terrariums, and vintage sconces -- will seat about 50 people at low-top tables. An additional 11 seats at the bar and five high-top tables totaling 10 seats are also available in the Homestead interior space. Executive Chef Chris Curren – who has spent the last 11 years as a chef at some of the top restaurants in Chicago and Cleveland – has crafted a food menu for Homestead rooted in “rustic elegance” where he utilizes seasonal herbs, plants, vegetables, and fruits harvested from Homestead’s 1,000 square-foot organic rooftop garden, a private “Homestead-only” farm outside of the city of Chicago, other local and high-quality farms, and local-whenever-possible meat, seafood, and poultry purveyors. Dishes marked with an asterisk (*) on Curren’s attached Homestead food menu indicate large/entrée plates. All of Curren’s other dishes on the Homestead menu are smaller/share plates. Curren’s Homestead menu is broken down into four sections. The menu’s first section, “From The Garden”, features four composed salads. A standout dish from this section is the “Duck Egg” salad that features a poached duck egg atop wild mushrooms, asparagus, wild mushrooms, English Peas, pickled ramps, and pumpernickel croutons, and pumpernickel crumble. The menu’s second section, “From The Mill”, includes three housemade pastas and a “Bread Basket”. The “Bread Basket” from executive Pastry Chef Chris Teixeira includes four housemade and house-baked breads (manchego & Jamón Serrano laminated brioche, Pan d' Epi, berb sourdough, and ciabatta) that are served with whipped Oaxacan-honey butter, house pickles, and a tomato-herb oil. One of Curren’s signature pastas is an agnolotti stuffed with sweet corn, manchego cheese, and shallots. The agnolotti is accompanied with wild mushrooms, baby squash, lardo, and chili powder. A parmesan-sweet corn broth is poured tableside for over the pasta and its accompaniments. with middleneck clams, dried corn, marble potato chips, crumbles house-made chorizo, carrots, smoked fennel, and a clam-and-corn broth. The menu’s fourth section, “From The Land” features six meat and poultry dishes. A highlight from this section is the “Crispy Duck Leg” which features a duo of duck (confit thigh and a tasso-cured breast) served atop wild black rice cooked polenta style, pickled blueberries, and spiced heirloom carrots. Homestead Beverage Director Benjamin Schiller has created a tightly- curated specialty cocktail, spirits, wine, and beer lists. Many of these lists may evolve week to week. Schiller will open with seven specialty cocktails – each priced at $10 each. All of his specialty cocktail (except for the bourbon-coffee essence-pipe tobacco “Weston”) were created with a sweet-and-sour backbone that were meant to be light, refreshing, and sessionable summer cocktails to be enjoyed on Homestead’s rooftop. One highlight of Schiller’s specialty cocktail menu is the “Ghost Sign” which features a thinly sliced grapefruit wrapped around the inside of a Collins glass that’s mixed with tequila, Pimm’s, kumquat, and lemon. Schiller’s Homestead spirits list features at most seven different types of each liquor while highlighting high-end and underappreciated brands in each category. Schiller’s Homestead wine list is tight and esoteric highlighting organic, biodynamic, and small-case production wines. Three sparkling, six white, and six red wines are available by the glass. Three champagnes, 15 whites, and 15 reds are available by the bottle. Beer-wise, Homestead will rotate a single brewery’s beers per week. Anchor Brewing out of San Francisco will be the first brewery featured at Homestead with two of its beers on tap and three available in bottles. Before joining Homestead and The Fifty/50 Restaurant Group, Schiller was most recently in charge of the cocktail and spirits program at Boka Restaurant Group for properties Boka, GT Fish & Oyster, and Girl & The Goat. Prior to joining the Boka Restaurant Group in 2009, Schiller helped open The Peninsula Hotel Chicago and he was also the head bartender at In Fine Spirits in Chicago. Executive Pastry Chef Chris Teixeira (formerly of four-star Chicago dining landmark Sixteen) will open with three composed desserts on the Homestead menu. The desserts will change every week or two based on what’s best and in-season. A highlight from Teixeira’s opening dessert menu is the “Plum” featuring ginger-roasted plums over a buckwheat Sablé that’s garnished with crème fraîche chantilly, ginger fluid gel, a sesame seed tuile, and oat ice cream. Mayor Rahm Emanuel and the Department of Cultural Affairs and Special Events (DCASE) present the complete lineup for the 28th Chicago Gospel Music Festival in Chicago from June 20-23. Once again the Bronzeville neighborhood, the birthplace of Gospel music, will serve as the festival’s main home – with the weekend portion of the festival featuring two stages of music at Ellis Park (37th and Cottage Grove). Millennium Park will host opening night performances on Thursday, and the Chicago Cultural Center will host various events on Friday. Bringing one of the city’s heritage festivals to one of Chicago’s historic neighborhoods continues to fulfill the mission of the Chicago Cultural Plan by expanding and capitalizing on neighborhood cultural assets and bringing music and art to underserved areas. This serves to further the Mayor’s strategic vision to foster growth and development in neighborhoods such as Bronzeville across Chicago. Bronzeville was named one of the Mayor’s seven opportunity zones last week. In 2012, for the first time, Mayor Emanuel brought Gospel Fest to Bronzeville, the ancestral home of gospel. Now, in 2013, it returns. The Chicago Gospel Music Festival, presented by The Black McDonald’s Operators Association, moves to its festival home in Bronzeville’s Ellis Park (37th and Cottage Grove) on June 22 and 23 and this year many of Chicago’s homegrown talent will be performing on the Day Stage as music begins at noon. The festival brings back some favorites from previous years with Percy Bady who performs at 2:40 p.m. Born and raised in Chicago, Bady is a songwriter, producer and performer who is credited with influencing modern Gospel music. Malcolm Williams & Great Faith follow as Williams performs the music he was born to play, beginning his career at age six when he was named Director of a 60 member junior choir at a church in North Chicago. Closing out the afternoon are AM:PM – Anthony McGahee & Praise Motivated at 4:10 p.m. The Milwaukee native has conducted for Josh Groban and trained many academy choirs. The finale is Chicago-based gospel youth choir Joshua’s Troop which combines vocals with hip-hop, R&B and a jazzy gospel sound. Saturday also features an opportunity for festival attendees to take a free tour of Bronzeville’s historic churches. Sweet the Sound” choir competition. They take the stage 3:10 p.m. Gospel Music Excellence awards and was named Best New Artist. “How Sweet the Sound” winner Dexter Walker & Zion Movement on backing vocals. artists, a free-throw machine and McDonald’s Characters, including Ronald McDonald, will greet children. Health, attendees will learn about accessing preventative screenings and care. The Art Fair & Marketplace will offer festival goers the opportunity for a unique shopping venue featuring fine art, crafts, jewelry, clothing and more. Once again, Robinson’s Ribs, Star of Siam and Miller Pizza will be selling food and beverage on site at the festival. Prior to the weekend at Ellis Park, Gospel music will fill the halls of the Chicago Cultural Center, 78 E. Washington in three venues: Randolph Square (1st floor), Claudia Cassidy Theater (2nd floor) and Preston Bradley Hall (3rd floor) with midday performances on Friday, June 21. Later that evening, the Claudia Cassidy Theater will screen “The Sweet Sisters of Zion: Delois Barrett Campbell and The Barrett Sisters” at 5:30 p.m. Following the screening, there will be a discussion with The Barrett Sisters and the producer/director of the film, Regina Rene Davis. The festival will open on Thursday, June 20 at Millennium Park with a Gospel Choir showcase on the Jay Pritzker Pavilion Stage. The Chicago Gospel Music Festival is presented by The Black McDonald’s Operators Association and the Department of Cultural Affairs and Special Events, and sponsored in part by Pepsi, Inspiration 1390, Chicago Transit Authority, Aquafina, Communications Direct and LaGrou Distribution. For the latest information on the Chicago Gospel Music Festival including musical lineups, visit chicagogospelmusicfestival.us, like us on Facebook at Chicago Gospel Music Festival or follow us on Twitter @ChicagoDCASE. (Schaumburg, IL)—On Monday June 24, 2013, Tokio Pub will continue its monthly tradition of hosting a unique, casual and ever-so-satisfying beer dinner partnering with the Vermont based Magic Hat Brewing Company for an unforgettable evening. Chef Naoki Nakashima will work with Chef Phu Lu and his team to bring The Green Mountain State to your doorstep "Tokio Style", while you sit back, imbibe and dine. Check-in begins at 6:30 p.m. and the first round of food will be served at 7:00 p.m. The cost is $30 per person (excluding tax and tip), reservations are recommended and can be made by calling 847.278.5181. Tokio Pub specializes in fresh Japanese cooking, served in a richly-hued dining room with lively music, friendly service & an edgy atmosphere. Located adjacent to Shaw's Crab House in Schaumburg's Streets of Woodfield, Tokio Pub is open for lunch, dinner & cocktails. East Asian classics are blended with flavors from Japan & Latin America to create a unique pub menu. 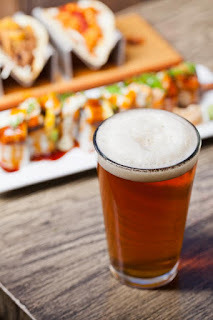 Try specialty Sushi, Tacos & our signature Hot Rock, along with Japanese Stir Fry, House-made Ramen & Tokio Pub's famous chocolate filled Beignets. , tweet at @Tokio_Pub, join the Mobile Club (text Tokio to 30364) or keep up on Facebook at www.facebook.com/tokiopub. Father’s Day is just around the corner. Give dad the most wonderful gift in the world, a beautifully hand crafted one of a kind tintype photograph of you and/or your family. Purely analog, a tintype is a direct positive photographic process that yields a warm silvery image onto black plated aluminum. Perfect for those looking to give a lasting gift. Book your session today at Rayko Photo Center, the place for all things photography! A Tintype is a photographic process from the 1850's that is a direct positive image captured on a black enameled aluminum or tin sheet. One of many things that differentiate it from other photographic processes is that it is a camera-original positive. In other words, most photography is a capture image today, then print the image at a later date. In the tintype process, the image and print are the same thing and made at the same time. There is no negative to make reproduction prints. Hence, each image is one of a kind. Due to limited availability and because Rayko Photo Center does not offer this service year-round, all portrait booking sales are final unless cancelled 3 business days in advance. Cancelled portrait sessions that meet the 3-business day requirement, will get a full refund. There are no rescheduling opportunities available as available times have been sold to other customers. Copyright Rayko Photo Center © 2013, All rights reserved.